I've always believed a gifted writer can write well in any circumstances. Whether composing a novel or an email or a tweet - it will always be inspiring. 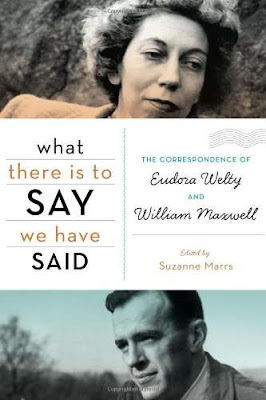 So I anticipated only goodness and light when starting What There Is To Say We Have Said: The Correspondence of Eudora Welty and William Maxwell. I already nursed an affection for Pulitzer Prize winning author Welty who spent much of her career writing about the South - a place of which I'm particularly fond. I expected a romance outlined in letters, but I was pleasantly surprised. This collection highlights a deep and abiding friendship between two kindred spirits of writing. When the humidity rises, I need to step away from gritty singer songwriter boys with their v-necks and skinny pants. It's summer, so less angst is a welcome reprieve. Cue Marc Broussard. If you like Dave Barnes or Matt Wertz (and you really should), then Marc will fit in nicely on your Walkman. His newest album, Marc Broussard, is knee deep in tracks that will make you forget your hair is frizzing and your knees are sweating. P.S. Don't forget to enter my lil' giveaway for a $40 Lowe's Giftcard. Recommending Disclaimer: I don't suggest anything because I get it free or because I have some sort of illicit relationship with dead Southern writers or living Southern musicians.